Nixon's latest headphones are a Stylus statement | What Hi-Fi? 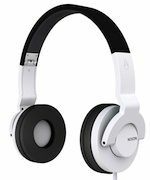 California-based watch and accessories company Nixon has boosted its headphone range with the arrival of The Stylus, a £100 model designed with a folding headband for use on the move. Available through selected stockists and Nixon's online shop, The Stylus is available in black or black-and-white finishes, and uses what the company describes as 'powerful, low-distortion drivers for even the heaviest music. These 4.5cm drivers are housed in closed-back shells with memory-foam earcushions, and the folding headband has a 'DJ fit' for security when using the headphones on the move. A removable mini-coil extension cable is provided, there's an inline three-button remote control/microphone for use with iPod, iPads and iPhones, and the headphones, which weigh 175g, come complete with a protective carry-pouch. The Stylus joins what is now an 11-strong range from Nixon, starting with the £35 Wire P (for pink) in-ears and going all the way up to the £170 RPM.